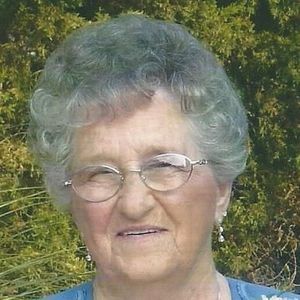 CENTRAL CITY - Margaret Miller Amos, 91, of Central City, died Sunday, December 11, 2016, at 6:58PM at Owensboro Health Regional Hospital. Mrs. Amos was born June 7, 1925, in Muhlenberg County. She was an inspector at A & G Egg, and the oldest member of Cherry Hill Baptist Church. She was preceded in death by her husband, George "Buster" Amos; and grandson Toby Day. She is survived by her daughters, Anita (Jr.) Stirsman of Central City, Doris (Presley) Bullington of Owensboro, and Sandra Day of Central City; six grandchildren; ten great-grandchildren; and brothers Frank Miller of Forest Oak, IL and Bill (Barb) Miller of Central City. Funeral services will be Thursday, December 15, 2016, at 2:00PM at Tucker Funeral Home in Central City, with Rev. Ron Matheny officiating, assisted by Rev. Leroy Rearden. Burial in Rose Hill Cemetery. Visitation will be Wednesday after 5:00PM at the funeral home. Online condolences may be made at www.tuckerfuneralhomes.com. Please know my prayers & thoughts are with you. run into each other, out and about, in our small county. & I live in Powderly. Condolences to the Amos family. My thoughts and prayers are with you in the loss of your loved one. May God wrap his loving arms around all of you, and give you peace during the days ahead. Another good one gone, so sorry to hear of your loss, prayers for the family. I am so sorry for your loss. My thoughts and prayers are with you during this time. I am so very sorry to hear about Margaret passing away. It wasn't too long ago we stood in Walmart and talked for a very long time. May she RIP.